Apologetics Press - "Unlike Naturalists, You Creationists Have a Blind Faith"
We openly grant that the accusation represented by the title of this article is true, at least for many individuals today. But not for all. What is “blind faith”? What is meant by the accusation? The idea behind “blind faith” is that a person chooses to believe in something or someone (namely, God) without any supporting evidence. The portrait painted in our minds is that of a person who puts on a blindfold and steps up to a ledge. He cannot see what is beyond the ledge. 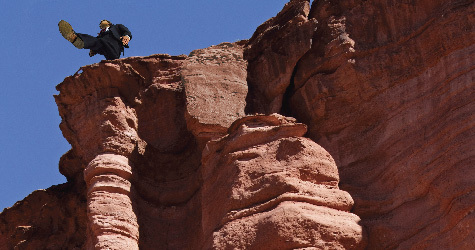 He has no idea how far down the drop is—whether or not he will plummet to his death, break his legs, or simply fall down. He has no idea if there is water, a trampoline, or rocks at the bottom. He simply decides to believe that he will not die if he jumps off—that he will be safe. He has no evidence, only pure, baseless “faith.” So, he takes a “leap of faith.” Question: who in their right mind would do such a thing? Whoever has such a faith truly is naïve, an extremely emotionally, rather than rationally, charged individual, and possibly is in need of counseling, or has an agenda for having such a belief system. Sadly many people have such a “faith.” Many people call themselves Christians, and claim to believe in the Bible, but clearly have not read it. They have a “blind faith” which, according to the Law of Rationality (Ruby, 1960, pp. 126-127), is irrational. Their belief in God is not based on the evidence, but is a blind leap into the dark without it. Philosphers call this phenomenon “fideism” (Popkin, 1967, 3:201-202). However, the biblical portrait of faith (Greek, pistis—translated equally as faith, belief, trust, or having confidence in; Arndt, et al., 1979, pp. 661-664) is not what some in Christendom have defined it to be nor what Hollywood has portrayed it to be. It is not “believing when common sense tells you not to,” as the 1947 movie, Miracle on 34th Street suggested (Seaton). It is not a “leap of faith” like Dr. Jones’ actions in Indiana Jones and the Last Crusade (Spielberg, 1989). The Bible does not advocate a “Feel, don’t think” mentality, like that encouraged by Qui-Gon Jinn in Star Wars (Lucas, 1999). Biblical faith is based on evidence (Hebrews 11:1). It is trust—comparable to the trust one has in a parent or friend—that is based on proof. We trust someone when he has proven himself to be trustworthy. When one listens to or reads revelation from God’s Word (i.e., what Bible believers call “special revelation”) and the information therein proves to be true, one develops faith in God (Romans 10:17). When one examines the evidence from the created order (i.e., what Bible believers call “general revelation”), and it points to the existence of a supernatural Being as Creator—rather than blind, random, accidental change over time—we learn to trust God based on that evidence. In short: The biblical model of faith requires evidence. According to the biblical model, the truth of God can be known—not felt or accepted without proof—and it will set men free (John 8:32). Sincere truth seekers examine what they have been told and investigate its veracity by pondering the evidence, as did the “fair-minded” Bereans of Acts 17:11, before becoming Christians. In fact, God (through Paul in 1 Thessalonians 5:21) tells the creationist that he is expected to prove or test something before believing it—only accepting what has been proven right or good. Do such passages give the impression that the Bible advocates a blind, evidence-less faith? A Book exists that contains certain characteristics that can only be explainable if it is what it says it is—the Word of the Creator. These proofs, and many others, provide evidence that demands an explanation and cannot be satiated by naturalistic theories. Only supernatural Creation provides an answer in keeping with the evidence. The Creation model can hardly be deemed unscientific. Its legitimate followers cannot be brushed aside as “blind” believers. Such sweeping accusations are unfair and betray a prejudiced, stereotypical mindset, to say nothing of the fact that such accusations fall victim to the ad hominem logical fallacy (“Fallacies,” 2012). In truth, Creation is the reasonable choice—the one not beholden to evidence-less leaps of faith. It is not contingent on the baseless, mythical claim that aliens exist and initiated life on Earth (cf. Miller, 2013a); that abiogenesis—like magic from a fictional novel—is somehow possible (cf. Miller, 2012b); that non-humans give birth to humans, as they do in the tabloids (cf. Flew and Warren, 1977, pp. 25,45,65); or the fanciful idea that Universes spontaneously pop into existence (cf. Miller, 2013c). Indeed, atheistic evolution is simply well-packaged superstition. Creation is the option in keeping with reason and the evidence. While some who call themselves “Christians,” do, indeed, have an unscriptural, blind faith, in truth, the same can be said of the evolutionary community—and more so. Why? (1) Because unlike evolution, the evidence does not contradict Creation but supports it, even though some have accepted Creation without that evidence; (2) because not all creationists hold to a blind faith. Some examine the evidence and draw the reasonable conclusion that a Creator exists. However, all naturalists must have a blind, evidence-less faith, since atheistic evolution is based on certain baseless, unprovable assumptions, including abiogenesis, naturalism, spontaneous generation or the eternality of matter, etc. (cf. Miller, 2013b and Kerkut, 1960 for other key, baseless evolutionary assumptions). Belief in those assumptions is purely blind. They (1) are not supported by the evidence, which classifies evolution as irrational; (2) actually contradict the evidence; and (3) even show the naturalist to be engaged in self-contradiction, which he blindly ignores when confronted with the evidence of his contradictions (cf. Miller, 2012a). It seems clear that it is the evolutionist—not the creationist—who holds to a blind faith. Robert Jastrow, evolutionary astronomer and founder and former director of the Goddard Institute for Space Studies at NASA: “At present, science has no satisfactory answer to the question of the origin of life on the earth. Perhaps the appearance of life on the earth is a miracle. Scientists [i.e., naturalists—JM] are reluctant to accept that view, but their choices are limited; either life was created on the earth by the will of a being outside the grasp of scientific understanding, or it evolved on our planet spontaneously, through chemical reactions occurring in nonliving matter lying on the surface of the planet. The first theory places the question of the origin of life beyond the reach of scientific inquiry. It is a statement of faith in the power of a Supreme Being not subject to the laws of science. The second theory is alsoan act of faith. The act of faith consists in assuming that the scientific view of the origin of life is correct, without having concrete evidence to support that belief” (1977, pp. 62-63, emp. added). John Sullivan, once a popular evolutionary science writer: “The hypothesis that life has developed from inorganic matter is, at present, still an article of faith” (1933, p. 95, emp. added). Richard Lewontin, evolutionary geneticist of Harvard University: “Our willingness to accept scientific claims against common sense is the key to an understanding of the real struggle between science and the supernatural. We take the side of science in spite of the patent absurdity of some of its constructs..., in spite of the tolerance of the scientific community for unsubstantiated just-so stories, because we have a prior commitment, a commitment to naturalism. It is not that the methods and institutions of science somehow compel us to accept a material explanation of the phenomenal world, but, on the contrary, that we are forced by our a priori adherence to material causes to create an apparatus of investigation and a set of concepts that produce material explanations, no matter how counter-intuitive, no matter how mystifying to the uninitiated. Moreover, that materialism is absolute, for we cannot allow a Divine Foot in the door”(1997, p. 31, 2nd and 4th emp. in orig.). G.A. Kerkut, British evolutionary physiologist: Spontaneous generation is “a matter of faith on the part of the biologist…. The evidence for what did happen is not available” (1960, p. 150, emp. added). Loren Eiseley, evolutionary anthropologist of the University of Pennsylvania: “With the failure of these many efforts, science was left in the somewhat embarrassing position of having to postulate theories of living origins which it could not demonstrate. After having chided the theologian for his reliance on myth and miracle, science found itself in the unenviable position of having to create a mythology of its own: namely, the assumption that what, after long effort, could not be proved to take place today, had, in truth, taken place in the primeval past” (1957, pp. 201-202, emp. added). Robert Hazen, evolutionary geologist who received his doctoral degree in Earth Science from Harvard University, a research scientist at the Carnegie Institution of Washington’s Geophysical Laboratory, and a professor of Earth Science at George Mason University: “I make an assumption that life emerged from basic raw materials through a sequence of events that was completely consistent with the natural laws of chemistry and physics. Even with this scientific approach, there is a possibility that we’ll never know—in fact, that we can’t ever know. It is possible that life emerged by an almost infinitely improbable sequence of difficult chemical reactions. If life is the result of an infinitely improbable succession of chemical steps, then any scientific attempt to understand life’s origin is doomed to failure; such a succession could not be duplicated in a program of lab experiments. If the origin of life was an infinitely improbable accident, then there’s absolutely nothing you or I or anyone else could do to figure out how it happened. I must tell you, that’s a depressing thought to someone like me who has devoted a decade to understanding the origin of life” (2005, emp. added). Fred Hoyle, distinguished atheistic British astronomer, and Chandra Wickramasinghe, professor of astronomy and applied mathematics at University College, Cardiff, Wales: “It is doubtful that anything like the conditions which were simulated in the laboratory existed at all on a primitive Earth, or occurred for long enough times and over sufficiently extended regions of the Earth’s surface to produce large enough local concentrations of the biochemicals required for the start of life. In accepting the ‘primeval soup theory’ of the origin of life, scientists have replaced religious mysteries which shrouded this question with equally mysterious scientific dogmas. The implied scientific dogmas are just as inaccessible to the empirical approach” (1978, p. 26, emp. added). If these quotes from eminent evolutionists do not prove that naturalistic evolution is a religious faith, and a blind one at that, what would? It’s no wonder that the late Colin Patterson, senior paleontologist at the British Museum of Natural History in London, said about evolution, “One morning I woke up and something had happened in the night, and it struck me that I had been working on this stuff for twenty years and there was not one thing I knew about it. That’s quite a shock to learn that one can be misled so long. Either there was something wrong with me, or there was something wrong with evolutionary theory” (1981, emp. added). These quotes simply do not characterize true Christianity or the true Creation model—but they do characterize evolution. Thus, it seems that the rank and file evolutionist’s self-incriminating, venomous accusations towards the creationist are well-represented by the Shakespearean quote, “The lady doth protest too much, methinks” (III.2). Be wary of the one who makes accusations the loudest and attempts to deflect attention from his own inadequacies. Bottom line: The true model of origins will be based on the evidence. It will be the rational model. It will not contradict the evidence at every turn. So atheistic evolution is not the true model of origins. “Fallacies” (2012), The Writing Center at UNC Chapel Hill, http://writingcenter.unc.edu/handouts/fallacies. Hazen, Robert (2005), Origins of Life, audio-taped lecture (Chantilly, VA: The Teaching Company). Lewontin, Richard (1997), “Billions and Billions of Demons,” The New York Review, January 9. Lucas, George, dir. (1999), Star Wars Episode I—The Phantom Menace, Lucasfilm. Miller, Dave (2003a), “Blind Faith,” Apologetics Press, http://apologeticspress.org/apcontent.aspx?category=11&article=444. Miller, Dave (2003b), “Modern-Day Miracles, Tongue-Speaking, and Holy Spirit Baptism: A Refutation--EXTENDED VERSION,” Apologetics Press, http://apologeticspress.org/apcontent.aspx?category=11&article=1399. Miller, Jeff (2012a), “The Atheistic Naturalist’s Self-Contradiction,” Reason & Revelation, 32:53, May, http://apologeticspress.org/apPubPage.aspx?pub=1&issue=1029&article=1763. Miller, Jeff (2012b), “The Law of Biogenesis,” Reason & Revelation, 32:2-11, January, http://apologeticspress.org/apPubPage.aspx?pub=1&issue=1018&article=1722. Miller, Jeff (2013a), “Directed Panspermia and Little, Green (Non-Existent) Men from Outer Space,” Apologetics Press, http://apologeticspress.org/APContent.aspx?category=9&article=4620. Miller, Jeff (2013b), “Don’t Assume Too Much: Not All Assumptions in Science Are Bad,” Reason & Revelation, 33: 62-64,69-70, http://apologeticspress.org/apPubPage.aspx?pub=1&issue=1122&article=2153. Patterson, Colin (1981), Written transcript made from audio tape of lecture presented at the American Museum of Natural History, November. Popkin, Richard (1967), “Fideism” in The Encyclopedia of Philosophy (New York: McMillan). Seaton, George (1947), Miracle on 34th Street, Twentieth Century Fox. Spielberg, Steven, dir. (1989), Indiana Jones and the Last Crusade, Paramount Pictures.